"How solar will destroy the power companies, in 5 easy steps." “The firm’s sweeping case focused in large part on debt markets’ apparent ignorance to challenge utilities are facing. We wanted to zero in on the astonishingly simple steps that makes Barclays lays out to make shaking up utilities quite possible. 1) Solar prices come down For the past few years, we have been quietly living through a stunning drop in prices thanks to an unintended loop of massive European subsidies and capacity overexpansion in China. 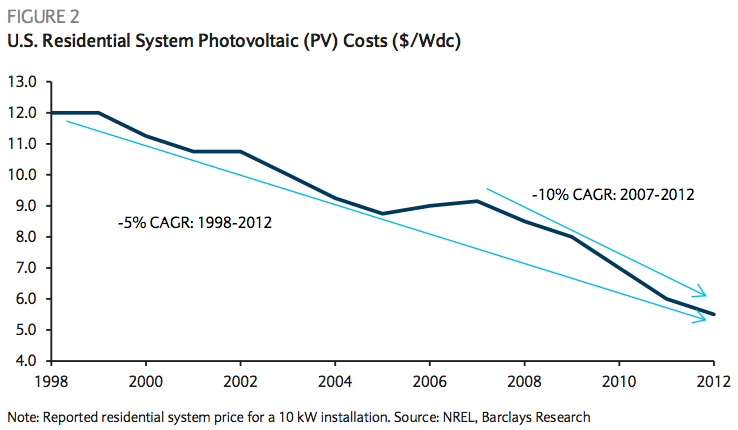 As a result, from 2006 to 2013, photovoltaic panel prices dropped nearly 70%. The next step is for storage prices to fall too. Cheap storage is key so that people can have power at night, when the sun is down. Right now, the cost of such systems — about $0.22/kWh is only competitive with retail electricity in Hawaii — the cost of vanilla electricity in California is $0.15/kWh. Barclays says Tesla has single-handedly brought down the cost of batteries over the past few years, from about $1,000/kWh in 2009 to $300/kWh in early 2014. If the company’s gigafactory successfully ramps up, costs could plummet. 2) The defection spiral commences Once the prices for everything get cheap enough, homeowners begin to leave the grid. There remains huge demand for solar, and as costs continue to fall, the price point will continue to match that sought by ever lighter hued green thumbs. This expanding scale will in turn make it more expensive to stay on the grid, bringing even more customers into the solar-storage orbit. “…Once solar + battery approaches the retail cost of power, its advantage can scale quickly,” Barclays says. 4) The decommissioning process begins As demand for baseload generation becomes less consistent, utilities could be forced to replace aging power units earlier than scheduled with more modern and efficient “peakers.” This could end up lowering utility margins, as well as bring forward cost loads. This is the key moment: Utility companies being forced to upgrade their plants in the face of a declining customer base. That’s a killer combination.